Zero indicates the absence of a quantity or a magnitude. It is so deeply rooted in our psyche today that nobody will possibly ask "What is zero?" From the beginning of the very creation of life, the feeling of lack of something or the vision of emptiness/void has been embedded by the creator in all living beings. While recognizing different things as well as the absence of one of these things are easy, it is not so easy to fathom the complete nothingness viz. the universal void. Although we have a very good understanding of nothingness or, equivalently, a zero today, our forefathers had devoted countless hours and arrived at the representation and integration of zero and its compatibility not only with all non-zero numbers but also with all conceivable environments only after many painstaking centuries. Zero can be viewed/perceived in two distinct forms: (i) as a number in our mundane affairs and (ii) as the horrific void or Absolute Reality in the spiritual plane/the ultimate state of mind. Presented are the reasons why zero is a landmark discovery and why it has the potential to conjure up in an intense thinker the dreadful nothingness unlike those of other numbers such as 1, 2, and 3. 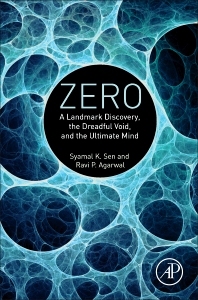 Described are the representation of zero and its history including its deeper understanding via calculus, its occurrences and various roles in different countries as well as in sciences/engineering along with a stress on the Indian zero that is accepted as the time-invariant unique absolute zero. This is followed by the significant distinction between mathematics and computational mathematics and the concerned differences between the unique absolute zero and non-unique relative numerical zeros and their impact and importance in computations on a digital computer. 2. Why Zero is a Landmark Discovery and the Dreadful Void! 6.11 Is error in error-free computation zero? 6.12 Is there anything beyond fundamental particle considered as a building block of matter? 6.20.5 Counting from zero? John Conway and Richard Guy. 6.24 The quantum universe: a zero-point fluctuation? 6.28 Why did the original name of zero come to be used for the whole set of Indo–Arabic numerals? A former professor of Indian Institute of Science, Bangalore (1996-2004) and Florida Tech, USA (2004-2012), Syamal K. Sen has authored/co-authored 9 books/research monographs by publishers such as Elsevier and Springer, several book chapters and over 150 research articles in computational sciences. During 1991, he was Fulbright Fellow for senior teachers. He supervised several Ph.D. students in computational OR and was the principal investigator of a couple of sponsored solar energy projects of Florida Solar Energy Center, University of Central Floridsa, USA. Currently he is the director of GVP-Prof. V. Lakshmikantham Institute for Advanced Studies, Visakhapatnam. Chairman of the Department of Mathematics at the Texas A&M University-Kingsville. He is formerly a Professor of Mathematical Sciences, Florida Institute of Technology, USA. Continues to be Editor-in-Chief of four prestigious Journals. Author of two books, including Nonoscillation Theory of Functional Differential Equations with Applications.